The class is a Cruiser-Racer class, and no attempt should be made to lay up or fit out a hull to give an unfair racing advantage. The Association recognises that certain boats, generally of home construction, may not be able to meet all the class specifications. In these circumstances the regulations sub-committee will issue class certificates when satisfied that conformance to a particular specification would impose unreasonable financial strain on the owner.In general, however, the class regulations are framed in an attempt to move the class towards one-design status and boats of current construction or boats built at Fibermans of Limerick will be expected to conform fully. 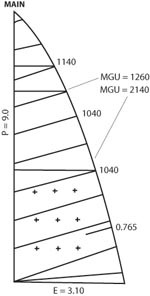 The Mainsail, Genoa, all Jibs and Spinnaker measurements are as the above diagrams. They must be of Terylene and of not less than 4oz. Spinnakers to be of Nylon. 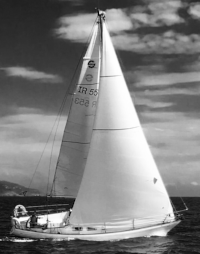 Excluding a storm jib of not more than 5 meters square, each boat is limited to carrying 3 headsails each of which must be declared and registered with the regulations sub-committee. 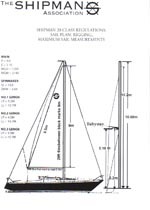 All new sails must be measured and passed by the class sail measurer before competing in class events.MAST Length of mast should be as per above sketch which form part of these regulations. 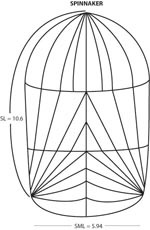 In all cases a black band shall be positioned such that its lower edges are not more than 10.2 meters from the mast step area on the deck, and the head board of the mainsail shall not be hoisted above the lower edge of such band. The interior shall be fully fitted for cruising with fixed galley, heads, and inboard diesel engine of not less than 12 horse power. It is permitted to strip out the interior of cushions and crockery for racing, providing the regulations sub-committee is satisfied that no boat is constructed in such a way so as to give an unfair advantage in weight consequent on such stripping out. Standard masthead rig. Standing rigging shall be of multi-strand steel construction of not less than 6mm diameter and shall consist of forestay, upper and lower shrouds, backstay and babystay. 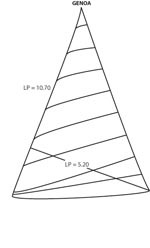 Length of boom should be maximum 3.4 meters measured from mast to end of boom and not more than 300mm in circumference. The boom shall be attached to a gooseneck fitting on the mast at a black band located 9 meters below the head board black band. The boom may not be hauled below this band. The pole must not be greater than 3.35 meters measured from inner jaw to outer jaw. Twin or grooved forestays are permitted. Must be 1.83 meters tip to tip minimum. Must be positioned 5 meters below the lower edge of the masthead black band. The babystay should be positioned 5.02 meters below the lower edge of the masthead black band. Headsail roller reefing is permitted. Only 2 spinnakers may be carried, both of which must be declared and registered. Sails may not be renewed more frequently than at 3 yearly intervals but this rule may be waived for damage replacements. Internal ballast may be carried but it’s weight must be notified to the regulations sub-committee at the beginning of the season and it may not subsequently be removed or added to. This must be carried as specified in ISA minimum requirements for local handicap day and overnight racing and cruising in yachts. Anchor and chain of combined weight not less than 30lbs must be carried in the forward anchor locker or forward of the babystay. The Helmsman and crew for the National Championships, Regattas and Royal Alfred Super League must be those who normally sail the boat. Changes must be notified to the Committee before any race in which they compete.